Some people would say that this is what denial feels like. Moments after the Polygon review of DuckTales Remastered went live, I had already copy-pasted the link to my gamer friends and leapt on over to read about what surely would be the next milestone in retrogaming, remakes, and re-imaginings. I’m a fan -- a true believer. I played the original DuckTales on the Famicom/NES to death and there was once a time when I knew every little secret in that game by heart. That made reading the review all the more devastating. All the negativity [is] downright baffling. That’s really disappointing. What’s more, all the negativity turns out to be downright baffling after I actually got a chance to sit down and play the game myself. DuckTales Remastered is not going to usher in a new age of gaming nirvana, but it’s an above average game that features exceptional 2D graphics and animation -- something I would not expect so soon after the sublime Dragon’s Crown. It’s also one of the few instances when a game has exactly met my expectations of it. Capcom and WayForward promised a beautiful update of a classic 8-bit title, and every single bit of that promise is present in the final build. 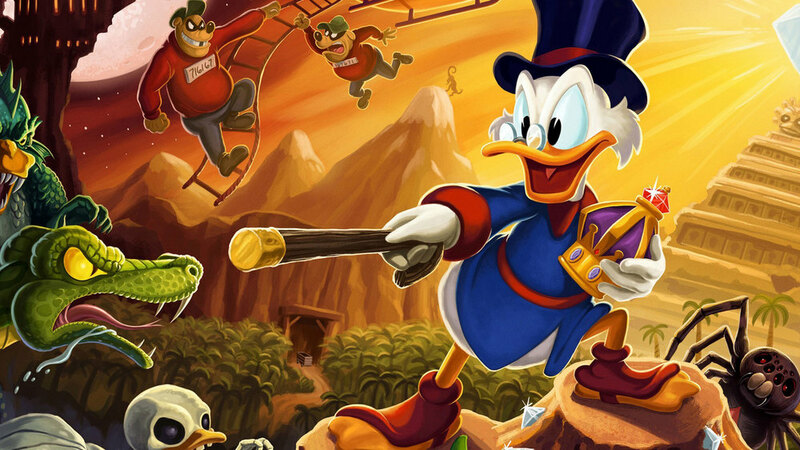 If you’ve never played the original DuckTales, you’ll still be in for a treat. The game is as straightforward as they come: as Scrooge McDuck, plow through five differently-themed levels, defeat the level boss, and collect the treasure at the end. Use your pogo cane and golf swing techniques to survive. Collect stuff to drive up your score. Many reviews painted this scenario as sparse, boring, and obsolete. Today’s gamers want complexity, and depth, and choices! I think there’s a danger in that reasoning. I think gaming is running the risk of becoming too much of a secluded “gamers-only” club, even as developers scramble to make their games easier and more accessible for the lucrative mass market. Just look at all the concepts we have to juggle and manage even in the simplest games: moving, aiming, attacking, reloading, weapon switching, climbing, ducking, jumping, moving and jumping, pushing, pulling, accessing our journal or inventory or map, and quite possibly, managing teammates. I won’t deny that I love complexity, but there’s room for simplicity in games, and not enough new titles deliver. That’s specifically why DuckTales Remastered is such an exciting prospect. It’s not just a nostalgia blast: the simplicity of the gameplay is both a breath of fresh air and a rediscovery of a challenge to overcome. DuckTales makes no excuses for being a pure test of dexterity with a real learning curve. I played for almost two hours the night I got the game, losing and continuing three times on the Amazon level and dying to the boss the last two times. I stopped playing, mildly frustrated at my inability to play through what used to be a walk in the park for seven-year-old me. When was the last time that pure game mastery got you through a game? What’s that? Dark Souls? That was a good game too, wasn’t it? The next morning, I beat the damn boss and started to tackle Transylvania, where I immediately got stuck again. The day after that, after a couple more hours of practice, I beat Transylvania’s boss and got into a just-one-more-level cycle, suddenly playing through the whole thing up to the end. That’s with zero power-ups or leveling up save for a couple of life bar extensions. I just had to learn the game to make it through. The Polygon review’s statement that “DuckTales: Remastered's controls are imprecise, stiff and unresponsive” is simply untrue. The game plays as tightly as it ever has: with a bit of practice, Scrooge will do exactly what you want him to. And for the retro-savvy out there, the movement and jumping physics are just like classic Mega Man. Just play this game and revel in the simplicity and the challenge of it all. I won't even mention the amazing music and sound updates because everyone already agrees that nothing bad can be said about them. An amusing parting note: it seems like my seven-year-old nephew, who belittles me for not owning an iPad to play Plants vs. Zombies 2 on and for not knowing what all the Angry Birds do, is quite crappy at this game. I had the game set to the ridiculously easy “easy” mode and he still couldn’t beat the Amazon boss. I don’t want to be part of the only generation in history that knows how to manipulate a gamepad. Guys, think of the children.